The Afghan government commission, furthermore, appears to have failed to list infants under the age of three who were killed. The government commission that went to the village after three days — when all the victims had been buried in mass graves by the villagers — is not willing to make their list public. How can the precious lives of Afghans be treated with such disrespect? 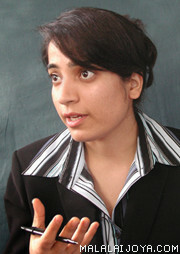 Malalai Joya was the youngest member of the Afghan Parliament, elected in 2005 to represent Farah Province. In May 2007 she was unjustly suspended from Parliament. Her memoir, A Woman Among Warlords: The Extraordinary Story of an Afghan Who Dared to Raise Her Voice, is forthcoming later this year from Scribner.